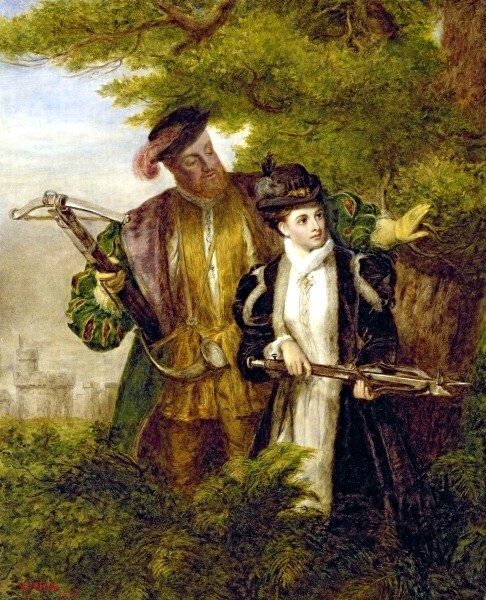 William P. Frith, 1903: King Henry and Anne Boleyn Shooting Deer in Windsor Forest. Finally, Henry closes with, “…and thus, for want of room, I must end my letter, written by the hand of your servant, who very often wishes for you instead of your brother [George Boleyn, Lord Rocheford].” He signs simply with, “H. R.,” for Henricus Rex, being Latin for King Henry or Henry the King. 1. Luce, John W. and Company, with designs by Florence Swan (1899). Love Letters of Henry Eighth to Anne Boleyn. Pp. V-VI. Boston and London: John W. Luce & Company (1906).